In the last ten to fifteen years, the pace of technological change has intensified exponentially, and it shows no signs of stopping. From smartphones to the app economy, new booking methods to expanding data collection, these advances have made traveling for business simultaneously more efficient and more complex. But the main questions we want to address here are the following: Do organizations have the resources in place to keep their business travelers safe, even if they book through non-corporate channels? And what exactly is technology’s role in ensuring the safety of employees on business trips? Learn what that means for managed travel programs and duty of care. In an ideal world, travelers should be able to book however they want, right? It’s convenient, it’s easy, oftentimes it’s a traveler’s preferred method due to hotel or airline loyalty, or because they have a wider variety of options. However, it’s not that simple. For instance, while it seems to save money for the traveler, booking cheaper rates through non-corporate channels can be costlier in the long run. Travel buyers are unable to capture data to leverage the volume that isn’t tracked and travelers themselves are unable to receive negotiated rates when booking direct. Furthermore, when travel managers aren’t able to capture a full itinerary, it becomes even harder to serve an employee when an emergency comes up. That could include locating them at a moment’s notice, finding the best alternative flight for them if needed, or getting appropriately timed emergency alerts to them. In a recent study, the research firm GBTA found that as many as 80% of travel buyers don’t use technology to capture outside bookings. Nearly half of business travelers said that the only way for their organization to know where they traveled is through their expense reporting, which may not be updated immediately. And finally, GBTA discovered that 38% of companies expected their travelers to manually forward their itinerary to someone in the organization. 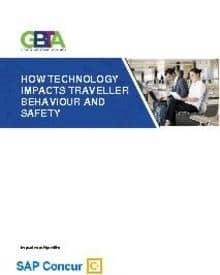 “Travel managers need a better way to capture complete, accurate information of all travelers on business trips in order to fulfill duty of care responsibilities,” GBTA says in the report. What technological innovations would motivate travelers to book through corporate channels? The responses to this question might hold some clues. One-third of business travelers say efficiency is the number one priority in using their company’s travel booking tool, and many of them also said they want to have personalized booking experiences. But if travelers regularly book with outside suppliers, companies will need technology to offer personalized results that are in-policy, but also must provide ways to capture all traveler data. Interestingly, though, despite the safety concerns around booking outside of corporate channels, travelers still have a high desire for safety features. Rounding out the top five most important elements of a company app are available support during emergencies (76%), destination specific safety alerts (74%), and travel safety alerts (72%). Because travelers value these safety services so highly, adopting travel technology with these additional features could draw travelers back to using the company’s travel tools. This would offer them not only personalization options but would also give the company enough data to keep them safe – no matter what happens on their trip. Read the full report to learn more about technology’s role in keeping your travelers safe on the road and how SAP Concur solutions can help.